Matthew Broderick starred in Godzilla (1998), which was originally supposed to be the first of a trilogy of films. However, film critics were merciless in their criticism of the film, and the American movie public didn’t disagree. The movie cost 130 million dollars to produce and promote, and made 138 million in its’ U.S.A. release–not a flop, but not a large success, either. So what, if anything, is wrong with the film? First, it’s not very original. Several scenes are shot for shot reproductions of Jurassic Park–there’s nothing wrong with paying homage to a film, but Godzilla comes too close to being an obvious rip-off. Secondly, the human characters are too two-dimensional, making it hard for the audience to care about them. Thirdly, the title character doesn’t spend enough time on screen–and just when Godzilla is getting interesting, the film cuts back to the uninteresting human actors. Finally, the character of the main character, Godzilla, is very wrong. The visual look is different, which I frankly don’t have a problem with; however, the actual traits of the character are remarkably different. 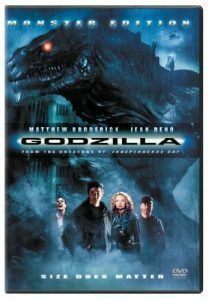 Fans of Godzilla have come up with various nicknames for this movie’s version, such as ‘Zilla (since the filmmakers took the ‘god’ out of Godzilla), G.I.N.O. (Gozilla In Name Only), etc. The traditional Godzilla is very aggressive, and fights easily; ‘Zilla here tends to spend much of his time running away. The traditional Godzilla is much stronger, with much tougher skin; ‘Zilla is easily killed at the end of the movie by missiles fired from aircraft. Godzilla has a devastating atomic breath weapon, that he uses often as a ranged attack; ‘Zilla originally had no breath weapon at all, with the filmmakers adding a strong screech, capable of knocking over cars, that really isn’t comparable. Oddly enough, the cartoon series Godzilla: The Series based on the movie fixed many of these deficiencies, making the cartoon ‘Zilla more popular than the original. Do I recommend this movie? No, not really. There’s some foul language, it’s not that exciting, and the Godzilla seems a pale imitation of the original Japanese monster. Oddly enough, I am a fan of the animated series, which can be seen via cable TV’s “On Demand”. As “gigantic monster reptile attacks New York” movies go, you’ve got to admit that Godzilla delivers the goods, although its critical drubbing and box-office disappointment were arguably deserved. It’s a shameless, uninspired crowd pleaser that’s content to serve up familiar action with the advantage of really fantastic special effects, and if you expect nothing more you’ll be one among millions of satisfied customers. There’s really no other way to approach it–you just have to accept the fact that Independence Day creators Roland Emmerich and Dean Devlin are unapologetic plagiarists, incapable of anything more than mindless spectacle that can play in any cinema in the world without dubbing or subtitles. Lucy: He is scum! As far as he’s concerned, you’re just a pair of breasts that talk. Animal: Hey, there’s an image. Dr. Niko Tatopoulus: He’s not some monster trying to evade you. He’s just an animal. If you find what he wants, then he’ll come to you. Dr. Niko Tatopoulus: Well, what do we know? Uh, it was first sighted off the French Polynesian Pacific. That area has been exposed to dozens of nuclear tests over the past 30 years. Dr. Niko Tatopoulus: This thing is much too big to be some lost dinosaur. Dr. Niko Tatopoulus: The radiation isn’t an anomaly, it’s the clue. Sergeant O’Neal: I can’t believe it, uh… he did all of this and… we did nothing to him. Dr. Niko Tatopoulus: Ah, that’s not true. We fed him. Animal: Where did you find this guy? Dr. Niko Tatopoulus: He’s from France. Audrey Timmonds: It’s been eight years. Some people change. Dr. Niko Tatopoulus: Most people don’t. Animal: What do we do now? Philippe: Running would be a good idea. Audrey Timmonds: Wait, I don’t get it… If he’s the first of his kind, how can he be pregnant? Doesn’t he need a mate? Dr. Niko Tatopoulus: Not if he reproduces asexually. Audrey Timmonds: Where’s the fun in that? Philippe: I am Philippe Roaché, DGSE – Direction Générale de la Sécurité Extérieure. Dr. Niko Tatopoulus: It sounds… big. Lucy: That’s my husband! That’s my husband! Oh my… I’m gonna kill him! Audrey Timmonds: How close did you get to the thing? Dr. Niko Tatopoulus: I’ve always wanted to join the French Foriegn Legion. Audrey Timmonds: Hey where you going? Charles Caiman, WIDF Anchor: Ladies and Gentlemen, we New Yorkers like to believe we’ve seen it all… what you’re going to see right now will shock you beyond belief. This is, uh, footage we have that indicates that there is a dinosaur loose in Manhattan. Animal: Oh! Oh you gotta be kidding me man, we’re in his mouth! We’re IN HIS MOUTH! Philippe: [holding up a doughnut] No croissant? Ed, WIDF Engineer: What? There’s no Rangers game on tonight! Animal: Better step on it, Mr. French! Dr. Niko Tatopoulus: This is not good! This is not good! Dr. Niko Tatopoulus: [after Godzilla discovers one of his dead offspring] He looks mad! Dr. Niko Tatopoulus: Wrong floor. Philippe: Anyone care to join me? Dr. Niko Tatopoulus: That’s a lot of fish. Dr. Niko Tatopoulus: [Repeated line after someone mispronounces his name] It’s Tatopoulus. At the 1998 Golden Raspberry Awards, the film was nominated for five Razzies, including Worst Picture, Worst Director and Worst Screenplay. It took home two overall for Maria Pitillo as Worst Supporting Actress and for the film as Worst Remake or Sequel. An animated series called “Godzilla: The Series” (1998) was made which continued the storyline of the film. In the series, Tatopoulos accidentally discovers the egg that survived the destruction of the nest. The creature hatches and imprints on Nick as its parent. Godzilla’s color scheme was based on the urban environment of New York so that the monster would be able to blend in with its environment. Patrick Tatopoulos (I), who designed the new Godzilla, states that the creature design mixes elements of various Reptiles; also, he wanted the creature to be imposing and to inspire respect. To achieve that, he was inspired from the character Shere-Kan featured in The Jungle Book (1967); the Tiger had a noticeable chin and Tatopoulos applied this characteristic on his design, taking the appearance of it from what he refers to be a “Selfin Dragon”. He also gave the creature humanoid shoulders and hands, very similar to the features included in the original design. Roland Emmerich admitted that he did not like the original Godzilla movies – he only agreed to the project after being promised to be able to do what ever he wanted with the series. In a television interview, Matthew Broderick said that the entire cast were given wet suits to wear underneath their costumes while filming in Hawaii. He was upset because his wet suit zipped up in the back, which made it difficult to put on every day. One day during a break in filming, he was talking with co-star Hank Azaria, who had his shirt off, revealing a wet suit that zipped up in front. Broderick remarked, “Oh, your wet suit zips up in front.” Puzzled, Azaria replied, “They ALL zip up in front.” Broderick had been putting his wet suit on backward every day. Godzilla wasn’t supposed to have any breath weapon at all in this movie until an outraged fan poll demanded it. The film had quite of a backlash amongst the fan base of the original series. The fans conceived a nickname to distinguish this film from the original; it was G.I.N.O., which is an acronym for “Godzilla in Name only”, indicating their despise for it. Toho introduced in the series a Monster called Jira in Godzilla: Final Wars which was meant to directly reference the creature. Half way through a screening, Kenpachiro Satsuma, who played Godzilla from 1985-1995, walked out saying It’s not Godzilla. It doesn’t have the spirit. Mayor Ebert and his assistant Gene are spoofs of film critics Roger Ebert and his late partner Gene Siskel. This is in response to the duo giving negative reviews to Emmerich and Devlin’s earlier films Stargate (1994) and Independence Day (1996). When mayor Ebert is introduced he holds up two thumbs, the mark given by Siskel and Ebert to movies they like the most. Mayor Ebert’s campaign slogan is “Thumbs Up For New York!”. And when Gene disapproves of Mayor Ebert’s latest platform (of exploiting the Godzilla disaster for his own benefit) he gives him a thumbs down. When the actual Siskel and Ebert reviewed the film on their show, it received two thumbs down and Gene Siskel commented on being spoofed in the film; he said it was “petty”. The first sequence of the AH64-Apache gunships hunting Godzilla through the streets references both Star Wars: Episode V – The Empire Strikes Back (1980) with the line “Echo 4 to Echo Base” and Star Wars: Episode IV – A New Hope (1977) with “He’s right on my tail! I can’t shake him!” Both lines were spoken by Luke Skywalker (‘Mark Hamill’). The television station call letters, WIDF, are a reference to the film Independence Day (alias ID4), also made by the team of Dean Devlin (I) and Roland Emmerich. Elevator music in a scene with Matthew Broderick is “Danke Schoen”, which Broderick lip-syncs in a memorable scene from Ferris Bueller’s Day Off (1986). The extra killed in his car when Godzilla first arrives in Manhattan was cast as a look-alike for J.D. Lees, editor of G-Fan magazine, because he cast disparaging remarks about the information that leaked out about the film prior to its release. The meter of the cab after the final chase sequence reads $95.20.